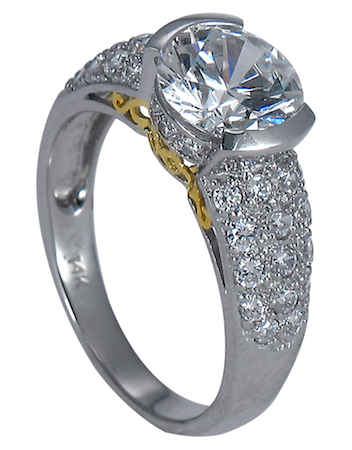 The Mirabella 2 Carat Round Cubic Zirconia Semi Bezel Pave Engagement Ring will take her breath away. This gorgeous solitaire ring has contemporary styling featuring a 2 carat 8mm round diamond quality cubic zirconia placed in a semi bezel setting a midst a collection of pave set rounds on the band. This engagement ring setting also features a 14k yellow gold scroll designs on both sides of the vertical walls beneath the center stone. 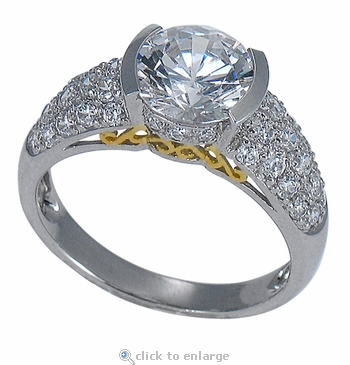 Another great thing about this ring is that is can be worn as a solitaire and a band all in one. 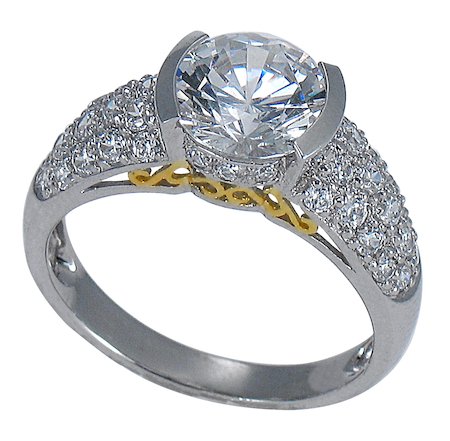 You can also couple this ring with a complimenting wedding band for a great bridal set. The band measures approximately 4.75mm at its widest point and includes over 3 carats in total carat weight of the finest diamond simulants available.